Here are two gouache portraits I painted while waiting for supper. Our beloved art-teacher friends David Starrett﻿ and Sam Clayberger mentored us 35 years ago when Jeanette and I were were just sketching companions. When we're with old pals like these, the years disappear, and we live in a moment that I wish could last forever. Your affection shines through in these warm and engaging portraits! 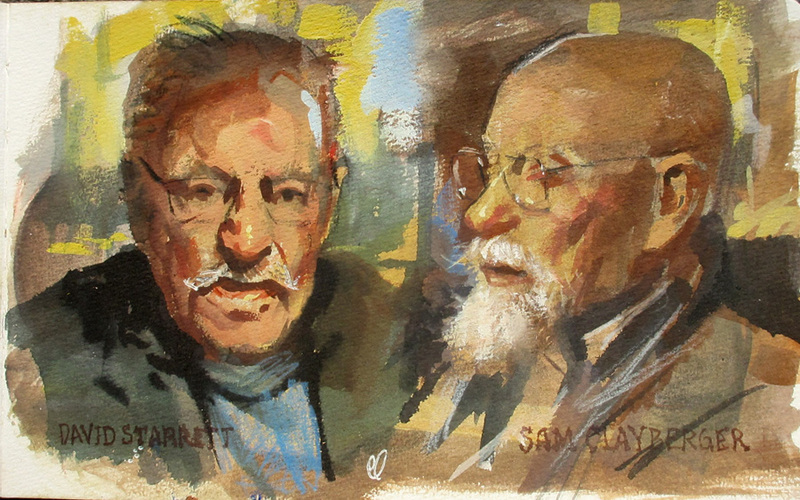 Great portraits, how do you manage the value shifts that gouache colors go through as they dry? Seems like that would be very important on portraits. These are great! Keep those moments coming! James, I love how you handle gouache. I haven't painted with the media since art school, but you inspire me to try them again. I am definitely looking forward to your next video on Gouache Painting in the Wild.